“Pontormo: Miraculous Encounters” at New York's Morgan Library and Museum is a small exhibit of works by the Mannerist artist Jacopo da Pontormo. It was organized in partnership with Florence's Uffizi Gallery and the J. Paul Getty Museum in Los Angles. Jacopo Carucci, called Pontormo after the Tuscan town from which he came, was born in 1494. His art education came from being apprenticed to several Florentine artists including Leonardo Da Vinci. Pontormo's abilities impressed his contemporaries including Michelangelo. He died in 1557. The centerpiece of this exhibition is an altar piece, “The Visitation,” which normally resides in e Pieve dei Santi Michele e Francesco, a small parish church near Florence. It depicts the Virgin Mary and St. Elizabeth meeting on a street. The Virgin is pregnant with Jesus and St. Elizbeth is pregnant with St. John the Baptist. Two female attendants look on and in the distance a few other figures are seen among the buildings. Also, in the exhibition is “Portrait of a Young Man in a Red Cap.” This recently restored work is part of a private collection. The exhibition also includes three drawings, one of which is a study for “The Visitation.” The drawings display Pontormo's superb skills as a draftsman. Their lines are fine and delicate. Furthermore, he has been economical in his lines, including only those that were essential to rendering the image. Similarly, the two paintings reveal a mastery of technique. The figures are beautifully drawn and at times appear almost three dimensional. 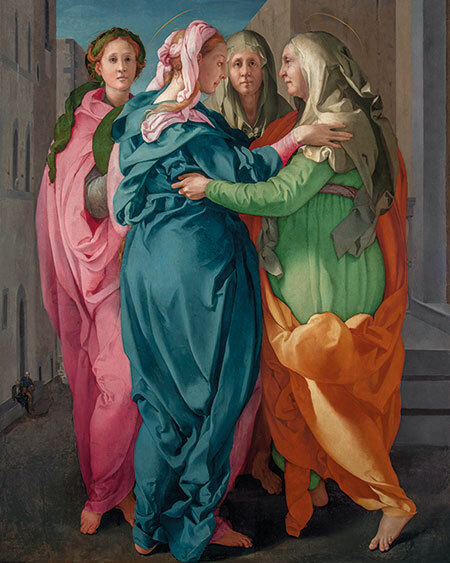 In the recently restored “Visitation,” the colors are bright and bold. A masterpiece, however, requires more than masterful technique. It needs to say something. Of the four central figures in the Visitation, only the Virgin Mary and St. Elizabeth have personality. Their two attendants look on expressionless at the two central figures. St. Elizabeth appears to foresee the tragic endings that will befall the two unborn children. The Virgin also seems to know the children's fate but gazes reassuringly at Elizabeth as if to assure her that it will all be for the best. Thus, “The Visitation” does communicate. Interestingly, the attendants have expressions in the preparatory drawing for “The Visitation.” There, they echo St. Elizabeth's premonition of tragedy to come. Perhaps to focus the viewer on the exchange between the two central figures, Pomtormo decided to give the attendants blank looks in the finished painting. The portrait is more difficult. Like the attendants in the Visitation, the man in the red cap reveals little of his personality. He stands proudly but his eyes do not meet those of the viewer. He is expressionless. We learn nothing about him. One is left to wonder whether this person had an elusive personality or whether Pontormo was just interested in dashing off a superficial likeness that displayed his mastery of technique. Art review - Morgan Library and Museum - "Wayne Thiebaud Draftsman"